I had heard of the Magdalen girls before and that they were affiliated to the Catholic Church, but I had not read about them. 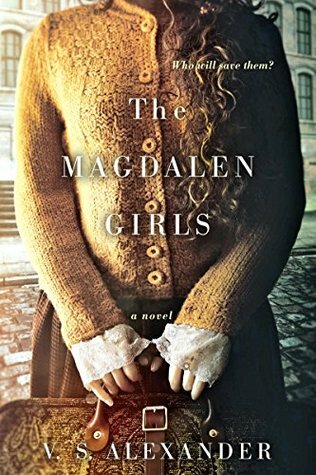 When browsing the new titles in the library catalogue, I came across The Magdalen Girls by V. S. Alexander and did not hesitate to put it on hold because I was curious. The story in the novel takes place in Dublin, Ireland in 1962 within the gated grounds of the convent of The Sisters of the Holy Redemption. The convent is one of the city’s Magdalen Laundries, an institution set up by the Catholic Church to help reform girls and women. Once places of refuge for women in trouble, these laundries evolved into grim workhouses with strict and severe regimes where women toiled without respite. Some inmates were “fallen” women – unwed mothers, prostitutes, or petty criminals – . but most were ordinary girls whose only sin lay in being too pretty, too independent, or in tempting the wrong man. Many of these women were forced into these institutions by the Catholic Church and families who did not want the girls living with them. Alexander’s story centres around Teagan Tiernan, a sixteen year old who is sent to the Laundry by her family when her beauty provokes lust in a young priest. At the convent, Teagan befriends Nora Craven, another girl who has been sent to the workhouse by her family. The girls are stripped of their freedom and dignity, given new names and denied contact with the outside world. The Mother Superior, Sister Anne, inflicts cruel and dehumanizing punishments on the girls in the name of love. Nora and Teagan find an ally in the reclusive Lea, a current resident who helps them endure their stay. Together they think of an escape plan. I enjoyed this well-written novel from start to finish. A story of friendship between three girls is woven into the historical facts of this time period. I kept hoping that Teagan, Nora and Lea would survive their experiences. And kept thinking that I am thankful not to be living in the 1960s in Dublin as a Catholic girl. Reading this novel informed me a little more about the Magdalen laundries in Ireland as well as giving many hours of reading enjoyment. If historical fiction is your preferred read, you will enjoy this sincere and compassionate story. Sounds like a good one. It’s hard to believe that something like this could happen in 1962. My teaser this week is from a cozy mystery – Bad Housekeeping by Maia Chance. Happy reading! I agree. I thought it had happened earlier and was surprised to find out this was happening not even 60 years ago. You had me at 1960s Ireland….what an interesting story! Thanks for sharing, and for visiting my blog. It is definitely an interesting story – and not run-of-the-mill. I always enjoy visiting your space. A rather harrowing read, perhaps, filling one with a desire to give those who doled out these iniquities large spoonsful of their own medicine. I hope the escape and aftermath went well. Uh-oh! Most people construe realism as being misery and despair. But one might expect that, so maybe it wasn’t that bad! I saw ‘Magdalen sisters’ and thought ‘depressing’ (isn’t there a film set in the laundries?) but this sounds really good from the teaser! I am not sure about a film. This book, though, is well written and although it is realistic, there is compassion and heart in the writing. The thought of what happened to these young women can be depressing but it is, however, a part of how women were treated not even a century ago. The good old days weren’t for everybody, were they, Colline? It sounds a good read. Sounds a bit like a dystopian novel I read written for teens (Unwind). The story, though, was well written and fast-paced. It DOES sound like good historical fiction! I hadn’t heard of it before. A concisely written review! Thank you Christy. I really enjoyed the story and made reading an historical phenomenon interesting.